News & Events # 55. 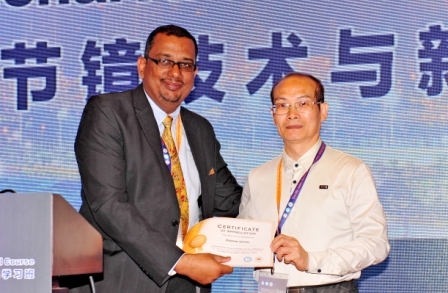 We are very happy to announce that 'The Superficial Quad Technique' was introduced to Chinese Colleagues by our consultant Dr Deepak Goyal during 19th China National Arthroscopy Skill Course held at Beijing on 15th October, 2016. 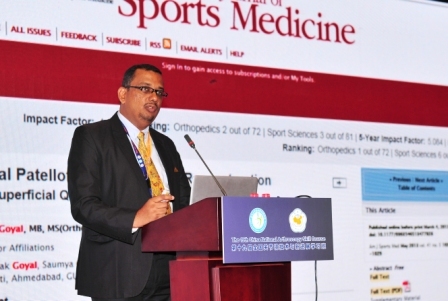 Chinese Arthroscopy surgeons asked many questions to Dr Goyal like his protocol to treat patella dislocation cases, his step-by-step guide to tackle recurrent patella dislocation cases etc. They also asked the method and amount of tension required to fix medial patellofemoral ligament (MPFL) during its reconstruction. Dr Goyal was very much pleased to answer all the queries that were asked for over 15 minutes and were translated simultaneously by a Chinese interpreter. Huang Huayang and Gong Xi appreciated Dr Goyal's talk and his innovative method.